Jesmonite AC300 Starter Kit - Industrial Plasters Ltd.
Jesmonite AC300 is a water-based, two-component, acrylic polymer/mineral resin system. The system is suitable for a wide range of casting and laminating applications where the end user wants to reduce the many risks associated with conventional solvent based systems. A range of ancillary products including decorative and functional fillers, control chemicals, pigments and glass reinforcements are also provided making the material extremely versatile. The material is designed for internal use only and is fire-resistant and has achieved a Class '0' Fire rating. The material is an economy alternative to Jesmonite AC100 where external durability is not essential. 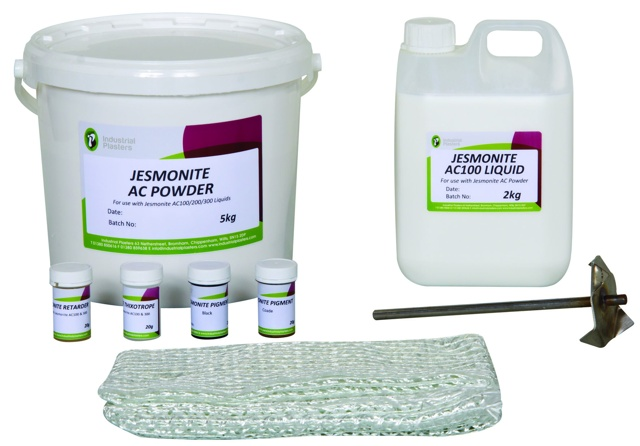 This starter kit contains: - 5kg AC Powder - 2kg AC300 Liquid - 65mm Mixing Blade - 20g Black Pigment - 20g Coade Pigment - 20g Thixo Additive - 20g Retarder - Quadaxial Fabric - Full instructions and user guide. Jesmonite AC300 is suitable for both cast and laminated decorative mouldings, and with the inclusion of suitable glass reinforcements can be utilised for lightweight, high-impact panels. It also provides a Class 1 fire resistant surface coating for expanded foams for theme parks, theatre props, sculpture etc. The material provides users with a water-based alternative to standard Glass Reinforced Polyester for rigid moulds and tooling.